NASA announced a roadmap last week for its new heavy-lift rocket that is expected to one day take astronauts beyond low-Earth orbit, to destinations including an asteroid and Mars. The first test flight of the $10 billion SLS is slated for 2017, and efforts are already underway to build the next-generation rocket. That's where Pratt & Whitney Rocketdyne comes in. California-based Pratt & Whitney Rocketdyne has decades of experience designing and building rocket engines, including the workhorse space shuttle main engines (SSMEs). The company was also involved in early work on NASA's Ares V heavy-lift rocket that was designed to return spaceflyers to the moon before the Constellation program was scrapped in 2010 by the Obama administration. Jim Maser, president of the firm Pratt & Whitney Rocketdyne. NASA announced last week that the Space Launch System will use modified space shuttle main engines powered by liquid hydrogen and liquid oxygen fuel, as well as solid rocket boosters for initial test flights. A competition will be held later to replace these side-strapped boosters with more advanced designs or liquid-fueled rockets, agency officials said. SPACE.com caught up with Pratt & Whitney Rocketdyne president Jim Maser to talk about the Space Launch System, and what it means for his company and the future of human spaceflight. SPACE.com: How involved was Pratt & Whitney Rocketdyne in shaping the design of the Space Launch System? SPACE.com: The space shuttle main engines (SSMEs) have been very reliable throughout the space shuttle program. What are the benefits of using this technology for SLS? Maser: The SSME is one of the most successful engine programs in rocket history. Its performance over the course of 135 shuttle missions was never expected to be as good as it was. Liquid propulsion, back in the time when this was developed, was one of the significant reasons for issues on launch vehicles. But with [SSMEs] being reusable, we could get the engine back and understand that engine better than anyone in the world understands an engine. We could conduct maintenance repair and overhaul, which was rare for a rocket engine up to that point. Second, for its class, the [SSME is the] most efficient engine ever built – it really gets a lot of energy out of the fuel it uses. The benefit we bring to the program is an incredible rich history of development and upgrades, flight history, maintenance, repair and cost-effective engine going forward that we believe will be equally reliable and more cost-effective. SPACE.com: What kind of modifications or upgrades will be necessary to integrate the SSMEs for use on the SLS? Our primary objective right now is to make the engine as produceable and as low-cost as possible. We can leverage a lot of our lessons learned from the RS-68 (liquid fuel rocket engine). We developed that completely on private funds. It's a very reliable, relatively low-cost engine to build. We can leverage some of those manufacturability and produceability improvements and methods into the SSME with the design we put into it for human-rating and multiple re-use. SPACE.com: The cost of the SLS booster is projected to be $10 billion. For the entire program (which includes funding for the rocket, MPCV capsule, and upgrades to the agency's Florida launch site), this works out to about $3 billion per year. Do you think this is a realistic assessment? Maser: The way I characterize it – first and foremost, the goal [NASA] had to achieve was to fit within annual budget constraints. I think that drove a lot of leveraging of existing work that's already been done. I think that was one of the big drivers. The SSME offers a definite time and affordability advantage from the standpoint that there are a number of engines that can be adapted. Engines are not on the critical path, and that's a benefit. SPACE.com: So are you confident with the timeframe that has been set out that aims to have the first SLS test flight in 2017? I think the configuration, to some degree, is driven by affordability and looking at what work has already been done. We want to get to flying as soon as possible, and time is money. So, I think given the work that has been done and the baseline that has been outlined, the architecture defined and the timeline outlined is very doable for that amount of money. But, I want to say, it's not doable for much less – this is not a slam dunk. It's doable, but at a minimum, that funding has to be maintained to execute. We're going to do anything on our part to contribute to that. When we look at traditionally the things we've been able to accomplish with the money available, we're going to partner with NASA to do more scope for the same amount of money. SPACE.com: You testified before Congress in March, saying that NASA needs a clearer vision of its direction following the retirement of the space shuttle program, especially so that the aerospace industry does not lose personnel and knowledge during the gap in human spaceflight. Does NASA's announcement of the SLS design satisfy those concerns? Maser: In the sense that we now know what the next-generation vehicle is. We basically know what we're going to be working on now. The program that's been laid out – it appears we can define a relative level of stability. It's my personal opinion that overall, this transition and building a new rocket should benefit from more funding from Congress. But, we know we're in tight fiscal times. If that's not in the cards, I think this is the most efficient way to execute it with the funding available. We know what the architecture is now, for the most part, but we still need to define the specifics. It needs a little more detail. I know NASA is working on that, of course. Ultimately having this vehicle is very important. SPACE.com: The last time we spoke, things were more up in the air about SLS and there were concerns about how much Pratt & Whitney Rocketdyne was going to be impacted by shuttle retirement. Is the SLS announcement a game-changer for the company? Maser: I would say it's a good step. We're trying to sort out, with this new architecture, what this means to our organization in terms of a total stable population going forward. As NASA comes forward – they're going to provide a synopses and industry day – we'll get smarter about how exactly we're going to execute. Then we'll have a better feel for what it means, in the long-run, for the health of our organization. Although we're very pleased that there's a decision, we think there are going to be some challenges in front of us due to the relatively low amount of money provided during the development phase of a new vehicle. 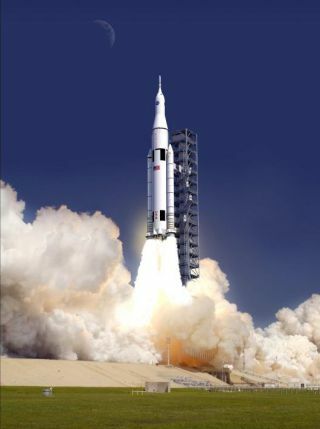 SPACE.com: It was announced that NASA will use solid-rocket boosters for initial SLS test flights, but will hold a competition to either modify or redesign these for future flights. Are we going to see PWR in this competition? Maser: Absolutely. This is opening up the trade space. Basically they're saying they're going to provide performance requirements and those could potentially be met by solid strap-on [rockets] or liquid strap-on [rockets]. We'll have to see the performance requirements, and based on that, we have a range of options. We are basically the most experienced company in the country when it comes to hydrogen and kerosene booster engines, and we've certainly flown more than anyone in this country. We intend to participate in a very aggressive way.